Texas bankruptcy court’s ruling Tuesday that found billionaire Sam Wyly and his late brother intentionally skirted taxes through a network of complex offhore accounts serves as a cautionary tale for those seeking to use professional advice as a shield for tax evasion penalties. 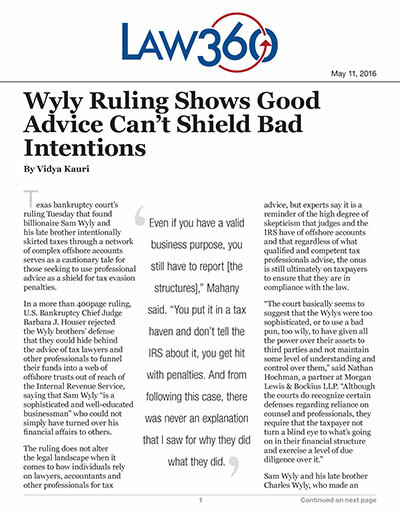 In a more than 400page ruling, U.S. Bankruptcy Chief Judge Barbara J. Houser rejected the Wyly brothers’ defense that they could hide behind the advice of tax lawyers and other professionals to funnel their funds into a web of offhore trusts out of reach of the Internal Revenue Service, saying that Sam Wyly “is a sophisticated and well-educated businessman” who could not simply have turned over his fiancial affirs to others. The ruling does not alter the legal landscape when it comes to how individuals rely on lawyers, accountants and other professionals for tax advice, but experts say it is a reminder of the high degree of skepticism that judges and the IRS have of offhore accounts and that regardless of what qualifid and competent tax professionals advise, the onus is still ultimately on taxpayers to ensure that they are in compliance with the law. Sam Wyly and his late brother Charles Wyly, who made an immense fortune through a series of publicly traded software companies and the arts and crafts retail chain Michaels Stores Inc., had established a lengthy paper trail that would pin their failure to fie tax forms for their offhore trusts on advice from tax professionals, according to Judge Houser’s opinion. The scheme started with the brothers receiving advice from a lawyer who promoted foreign trusts as a method of asset protection and tax deferral and relying on a slew of other professionals to intentionally avoid their tax obligations from the transfer of their stock options in Michaels and Sterling Software Inc. to offhore trusts in the Isle of Man, an island between England and Ireland, according to court documents. In particular, Judge Houser concluded that the Isle of Man trustees, who were supposed to independently control the assets, were essentially hired middlemen whose jobs depended on realizing the brothers’ “wishes” to use the trusts to fund their lifestyles and further concluded that the brothers made false representations about who really controlled the assets. Although it is not rare for high-net-worth individuals to depend on tax attorneys, trustees and accountants to manage their fiancial affirs, any advice received from tax professionals becomes worthless when clients aren’t being completely honest about their intentions, Mark Allison of Caplin & Drysdale Chtd. said. Brian Mahany of MahanyLaw also pointed out that complex offhore structures attract extra scrutiny from the IRS when there appears to be no valid business purpose behind them and that individuals and other entities are unlikely to get much sympathy from the IRS if the intent from the outset was to evade taxes. Ultimately, Judge Houser’s decision does not change taxpayers’ obligations and the responsibility of tax professionals to their clients, nor does it put limits on taxpayers’ reliance on experts. However, it is a reminder of how far the IRS will go to pursue suspected tax avoidance cases and impose penalties, Allison said. The agency has made a concerted effrt to step up its game to monitor offhore accounts with voluntary disclosure programs and enforcement of the Foreign Account Tax Compliance Act, and individuals should still consult with experts and even get second opinions to ensure their compliance with tax laws, especially when large sums of money are involved, according to Ronson J. Shamoun, principal attorney and CEO of RJS Law. The IRS is represented by Cynthia E. Messersmith, David G. Adams, Jonathan L. Blacker, Moha Yepuri and Holly Church of the U.S. Department of Justice. Sam Wyly is represented by Josiah Daniel, Jim Lee and Rebecca Petereit of Vinson & Elkins LLP, among others. Charles Wyly’s widow, Dee Wyly, is represented by Judith Ross, Neil Orleans and Eric Soderlund of The Law Offis of Judith W. Ross, among others. Both Wylys are represented by Don Lan of Lan Smith Sosolik PLLC. The case is In re: Samuel Evans Wyly, case number 3:14bk35043, in the U.S. Bankruptcy Court for the Northern District of Texas.